Mount Kerinci in the form of strato vulkano, has explosive character of eruption, interspersed with the existence of lava flows. Geological data is generally dominated by lava flows. This morphological unit occupies the southern part of the foot of the volcano, in the form of a bumpy hills. This area is covered entirely by falling pyroclastic rocks and is the basis of tectonic volcano graben buried by eruption of Mount Kerinci (Djoharman1972). The river that flows in this area is Sangir River, Air Putih River, is the eastern boundary; The Aro River, Padi River, Panjang River, Timbulun River, Belandir in the north and in the southern part consist of the Dry River, Kersik Tuo River, Deras Kanan River and Siulak River Deras Left and in the west is bordered by Lembul-Siulak Deras Kiri River. 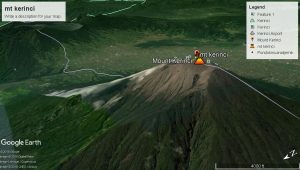 This morphology unit occupies the east and west of Mount Kerinci. The shape of the slope of this unit is very steep (almost erect) forming a very steep wall. This morphological unit is the rising part of the fault system of Sumatra (horst) that extends from north to south. The peaks contained in the eastern old border units consist of Bukit Ulu Batang Tandai (943 m); Mount Selasi (2391 m); Mount Mandurai Besar (2481 m), anonymous height point in topographic map (1956 m); (1574 m) and Mount Songka (1914 m). The peaks found in the morphology of the old western hills consist of Bukit Putus (893 m); Liki Hill (1045,8 m); Mount Hulu Sungai Kapur; Mount Terembun (2577) m) and Mountain Latitude (2218 m). The constituent rocks of this morphological unit consist of lava and pyroclastic flows. According to Van Bemmelen (1949) This volcano appears in a graben structure that is part of the Sumatran fault, Djoharman (1972) states that this volcanic body appears at the base of a tectonic vulkano graben perpendicular to the Bukit Barisan tectonic line that experiences a large fault time decline it happens. The peak consists of Mount Merapi (3655 m), Mount Elok (3649 m), this shape is similar to the old crater or the rest of the lava embankment. The peak of the southwestern slope (3805 m) commonly as Pesanggrahan Pondok Bunga is the highest crater rim of the enterprising crater now. The lowest and most extensive of the crater is located southeast with an altitude of 3620 meters, further to the north there are small bulges with a height of 3624 meters. The northwest slope is much narrower with a height of 3669 meters. Paleozoic-Mesozoic-aged rocks are located in the northern part of the Mount Kerinci complex, characterized by a rugged morphological shape and deep valleys due to continued erosion, composed of sedimentary rock and metamorphosis and Granite rock intrusions. The tertiary-aged rocks, spread extending to the west and east and south with the general direction of the northeast southwest. These rocks are composed of sedimentary rock (sandstone, silt, tufa, limestone), which are scattered in the southern part of Mount Kerinci. Old unknown volcanic rocks are originally scattered in the west and east of Mount Kerinci. These old volcanic rocks consist of volcanic rocks of the Seven Lakes and broken volcanic rocks of nine. Volcanic rocks of Mount Kerinci are composed of Lava rock, pyroclastic fall, pyroclastic flow and lava. This rock unit consists of several groups of rocks that are sorted according to their stratigraphic order divided into several groups (can be seen in the Geological map of Mount Kerinci, compiled by M.S. Santoso et al).